This month, thousands of students descended on university campuses across the country to find that, with a handful of exceptions, tuition and other compulsory fees had increased once again. In our report What’s the Difference? Taking stock of provincial tuition fee policies David Macdonald and I examine how the shift away from public funding to tuition fees plays out across the country and reveal how trend has accelerated since 1993-94. While education is a provincial responsibility, there is no question that the federal government plays an important role. Given the increasingly patchwork approach to university finance, it is crucial to revisit the federal role in the lead-up to a national election. Provincial governments are responding to growing public concern about the rising costs of university education. Half have implemented de facto two-tiered tuition fees, reducing costs for in-province students. All but two have capped the amount by which tuition fees can continue to increase annually, replacing accessibility with predictability. Only two provinces have implemented temporary freezes: New Brunswick and Alberta (one and two years respectively; Alberta explicitly increased funding for universities to enable this policy change). There is a range of provincial programs that provide some financial aid, from debt-reduction to targeted bursaries to various “incentive”-based initiatives. This has made for a highly complex, opaque system of assistance. But are the intents of these programs to ensure universal accessibility or to manage public opinion? The implementation of two-tiered systems has made for a complicated system of comparison. The cost of an education depends on provincial policy, the student’s province of residence, and the location of the university. Cuts to transfer payments from the federal government to the provinces in the mid 90s, combined with a removal of restrictions on how that money could be spent, precipitated the significant decline of the share of provincial public investment going toward university operating revenue — and the dramatic increase in tuition fees. In 1992, the average level of public investment was 77% — this declined to 55% in 2012. Over the same period, tuition fees as a share of university operating revenues increased from 20% to 37%. Currently the federal transfer for post-secondary education is 0.2% of GDP. Solution: (Targeted) money talks. An enhanced, dedicated post-secondary education transfer to the provinces would ensure that federal funding is used specifically to reduce tuition fees at source, rather than allowing provinces to reduce their level of support. While tax credits for education and other private savings mechanisms have been highlighted as evidence of assistance for students, tax credits disproportionately benefit wealthier families. Registered Education Savings Plans (RESPs) are of greatest benefit for families who have the disposable income to save in the first place. Enhancements to the Canadian Education Savings Grant (CESG), targeted to low-income Canadians, rest on the faulty assumption that what people living in poverty lack is the incentive to save for their kids’ education, rather than the disposable income to do so. Collectively, the amount of student debt is growing: once it became clear the previous $19 billion limit would be reached by January 2016 (well before the estimated date of 2020) the government increased it to $24 billion. They also announced they would be cracking down on students having difficulty making repayments. Solution: Overhaul the current federal loans-to-grants ratio, currently at nearly 4:1, and implement a more robust system of needs-based grants. This will reduce the financial burden on students, prioritizing those who are most vulnerable. The effects of student debt are significant and long lasting. It makes little social or economic sense to graduate an indebted generation into a precarious job market and insecure economy, where youth unemployment rates are about 13%. Debt delays the degree to which—and when—young people can fully participate in their communities, society, and the economy. Student debt represents and contributes to a tremendous loss of potential that affects us all. Solution: The federal government, in consultation with the provinces, must develop a comprehensive plan to address the socioeconomic burden of student debt, to address the issue of unpaid internships that take advantage of desperate and often indebted graduates, to reexamine the (in)adequacy of the minimum wage, and to implement a youth jobs strategy. The unraveling of a national commitment to post-secondary education based on principles of universality, accessibility, affordability, equity and accountability, is directly linked to the withdrawal of the federal government’s role back in the 90s. The range of provincial responses to this policy decision has led to a piecemeal approach to university finance. This resulted in vastly different degrees of downloading onto students and their families as they pursue higher education. It is time for a federal approach that restores adequate funding, recognizes the importance of needs-based grants over loans and private savings mechanisms, and implements a youth employment strategy that meets the social and economic needs of graduates and Canadian society. Erika Shaker is the CCPA’s Education Director and co-author of the report, What’s the Difference? 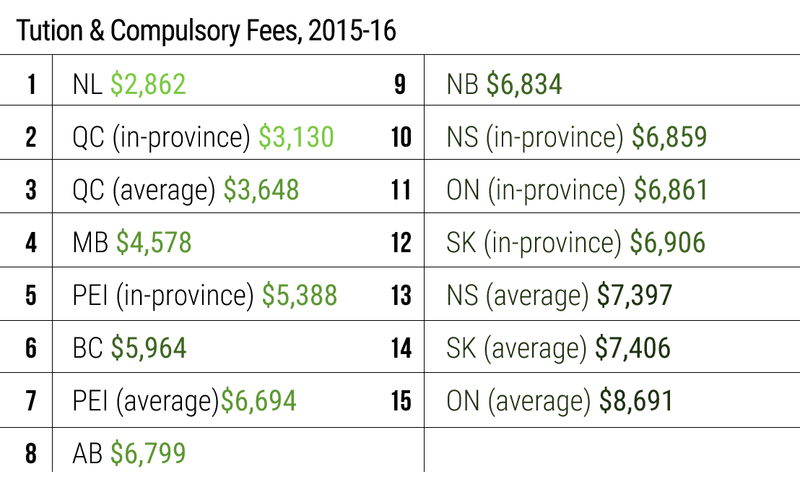 Taking stock of provincial tuition fee policies. Follow Erika on Twitter @ErikaShaker.